Home interior design will be on everyone’s minds over the next few months. While the snow is falling in Massachusetts, and we spend long hours in our homes, we look forward to spring cleaning and redecorating. While you are staying warm and cozy indoors, we interior designers are anticipating the trends in the upcoming seasons. We are already seeing the Pantone Color of the Year showing itself in accent furniture, feature walls, appliances and more, and while there are similar trends you can adopt in your own home, we are opting for simple interior design recommendations for the spring. 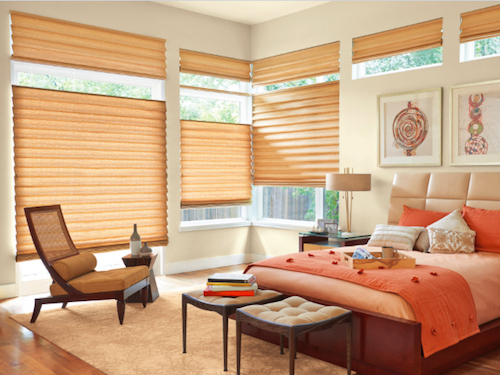 Spring is all about waking your home up, and bringing life after the cold winter months. Adding personal touches to your home during the spring is a wonderful way to prepare for the summer. As such, we are preparing to liven up our own homes with these interior design spring ideas. Try them for yourself! As we said, the Pantone Color of the Year is making its way in accessories like tablecloths and feature rugs. Though you certainly do not need to rely on just one color to make a statement. Baby blue, fuchsia and white are also making their way into spring. We see this on the runway, which will quickly establish itself into our homes. If you don’t want to set about painting and wallpapering your house, consider accenting the season with accessories. Spring screams pastel, and these colors are certainly making it onto the walls of our clients this season. Pastel is derived from chalky tones and elicits a soothing, comforting appeal. Use pastel colors in any room, from the bathroom and living area to kitchens and bedrooms. In the Spring, we recommend going with muted pastel paint colors. They are easily transferable to the Summer season and make a classic splash versus a loud, bold color. Flowers, we missed you! During the winter it can be a dreary house without floral arrangements. Without beautiful tulips, daffodils, peonies and more in season, we opt to a more rustic and natural look in the home. In the spring, our floral arrangements make an impressive appearance. Eagerly we immediately sign-up for flower delivery services and fill our homes with unique vases. Don’t be afraid to go all-in this spring! Diffusers are used year-round, though they are arguably most popular in the springtime. With the winter season nearly behind us, we are lusting for fresh scents in our home. One of the ways we can do this is through a natural diffuser. There are many retailers who offer natural diffuser options and unique oil blends. When it comes to diffusers and interior design, I recommend finding a product that can blend into your home. This AromaGem from Saje is an example of a small beautiful product that can diffuse up to 450 square feet. It is an excellent addition to your living area, bedroom, or bathroom. While you’re painting your walls a new shade of pastel, why not add new photo frames (and photos) too! Changing photos seasonally is a great way to keep your wall decor looking fresh and exciting. Use the photographs that you took last springtime for the upcoming spring months. Then do the same for summer, fall and winter every year. Not only can you capture the essence of the season but you can also finally use all those photos you have stored in your smartphone. Select your favorite moments captured with your phone and have them printed at your local photo store. 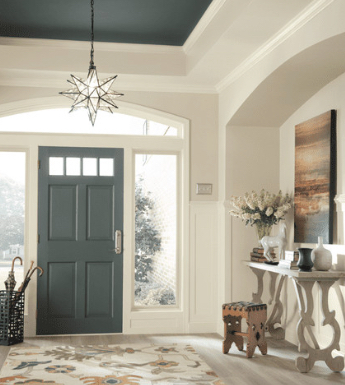 Livening up your home with new feature rugs, updating your wall colors, adding beautiful scents to your rooms and creating memories is a great way to prepare for the season that lies ahead. These are only a few of our interior design trends for the Spring, and we can’t wait to share more with you. Contact Melanie Kokoros at MDK Design Associates for more interior design ideas and plans. With the New Year comes anticipation and thoughts about how to update your home during winter. As we spend a lot of time indoors, we think about both our personal passions and ways to update our home decor. There is anticipation around resolutions set for ourselves, the wonder of what lies ahead in the calendar year and a sense of new visions for our home. As I was watching ‘Tidying Up with Marie Kondo’ on Netflix just the other day, I was thinking about these visions myself; creative ideas and home decor trends for 2019 that can be brought into client homes without buying new stuff. Simple additions can make a big difference. You might not have the passion for a full renovation in the middle of winter. Less than sixty days to spring but who’s counting? 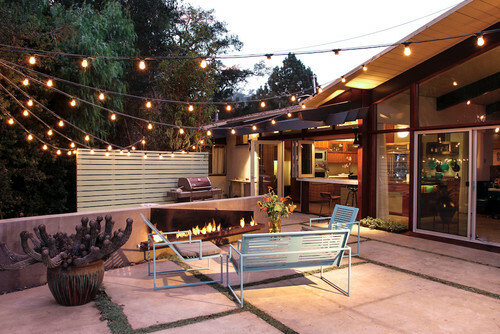 Warmer spring and summer months offer greater possibilities for full-scale renovations. There are a few things you can do indoors that can make an impact while we are waiting for another New England winter to pass by. So, I’ve included my tips on how to update your home this year without renovations. New year, new home as I like to call it. 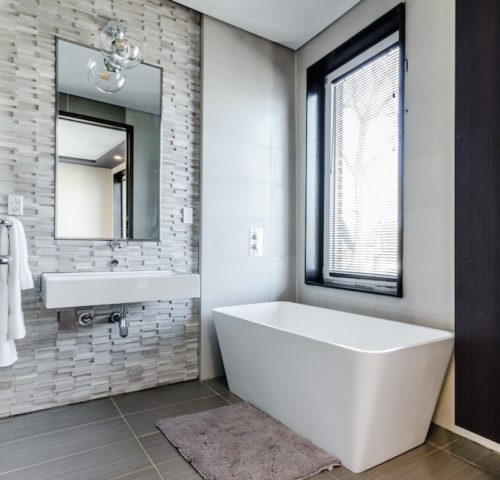 Beautiful, clean tile is continuing to be a trend in 2019. 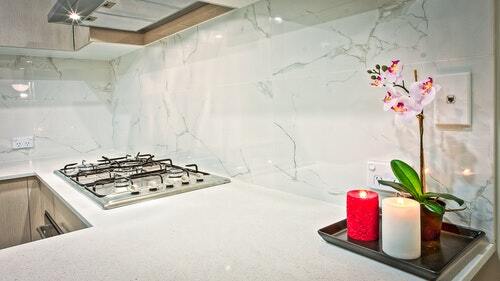 Stone and marble, are popular additions for a fireplace design. 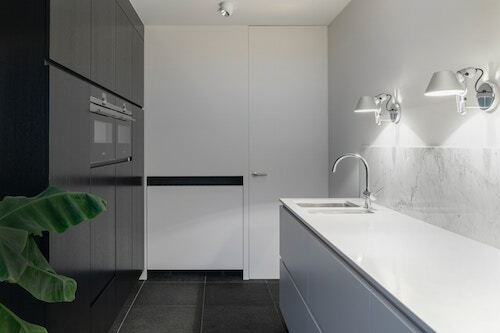 We have seen the advent of white backsplash and expect the trend to continue this year. There are plenty of options for such tile. From ceramic mosaic tiles to porcelain alternatives, the opportunity is nearly limitless. Updating your fireplace with new tile is simple but an impactful way to update your home. All you need is paint! Make a splash in the living room with a new color paint or accent wall. Consider a feature room that could use a bit of a lift. Paint can work wonders in most any room. 2019 is all about taking risks, especially in your home. Breaking out of your comfort zone with interior design is something that I am encouraging all of my clients to do this year. If you’re a DIY sort of individual, consider reading this reference guide on how to paint a ceiling. If you would prefer to hire a great painter, contact me for referrals. I love the ability to work with neutral tones on ceilings so if your living room is in need of a facelift, consider a deep grey or perhaps a midnight blue for an added touch of simple sophistication. Molding and millwork come in a plethora of options. It can be overwhelming to decide what is best for your home. One of the more popular molding types is Crown. Crown molding gives a finished look to any room. It is placed where the walls and ceiling meet. installing crown molding and don’t forget – measure twice, cut once! Door knobs are an excellent way to add some quick and easy updates to any room. Door knobs are easy to find in most home stores and online. 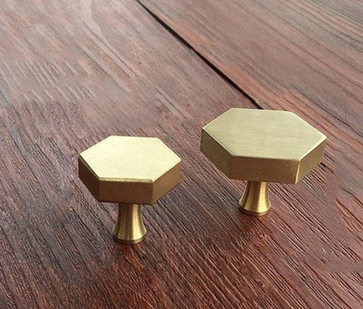 I love perusing Etsy to see what sort of great handmade options are on the market, like these copper hexagon knobs. Don’t forget – unique knobs can be placed on cabinets too! If your kitchen is in need of a lift, for example, give it life with a statement color or material. Spring is right around the corner even though it doesn’t feel like it. It might be a good idea to get ahead of your spring cleaning now. There’s no better time like the present, right? Watching ‘Tidying Up with Marie Kondo’ on Netflix, I was inspired to do my own tidying of sorts. The beauty of cleaning out your home is that you may discover uncovered items you forgot about. Sometimes something old can feel like a new treasure. 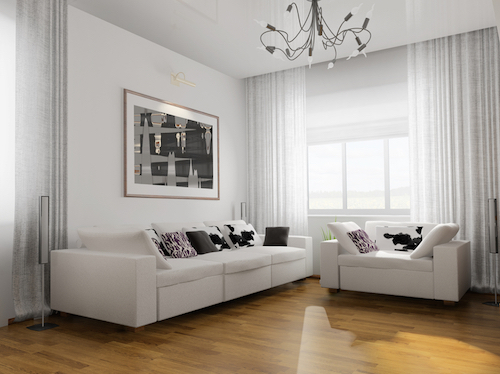 Create a sense of calm and simplicity within each and every room. 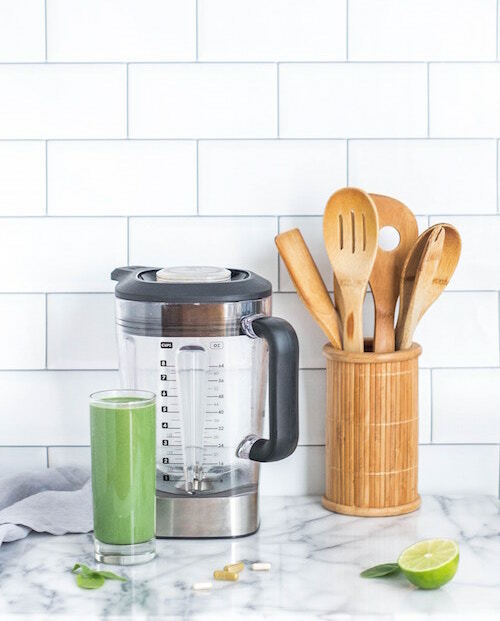 Consider a minimalist approach as a home update for 2019 – it won’t cost anything at all! 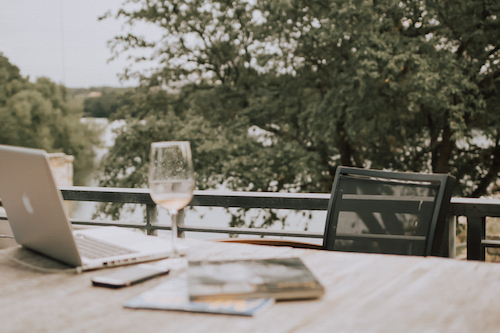 I am excited about the year that lies ahead, both for my clients and within my own home, too. For more ideas on how to update your home – no renovations needed please contact me here. Interior design color trends have a significant impact all around us. 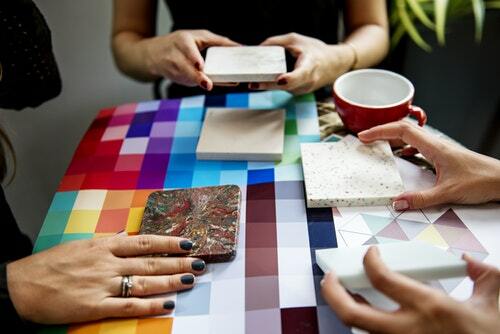 Designers from different industries keep a close watch on color trends. Home decor, graphic design, and fashion are all affected by colors. Nearly twenty years ago, in 2000, the Pantone Color Institute declared a specific ‘Color of the Year’. This specific color declaration provides a focal point for fashion designers, florists, interior designers, and more, with a palette to guide designs in the upcoming year. While the world of designers wait with bated breath, a secret meeting of representatives get together to decide on the Pantone ‘Color of the Year. Thoughtful consideration and trend analysis goes into process of selecting the best color for the year. We are excited to announce the new Pantone ‘Color of the Year’ into home designs in 2019. It’s a beauty! 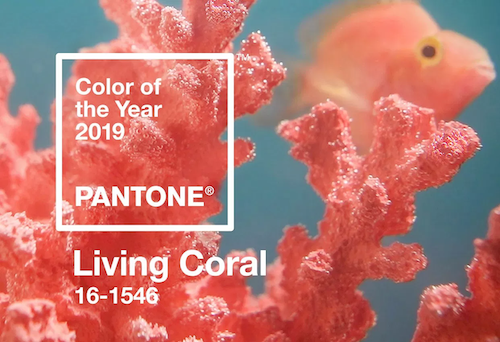 Living Coral has been selected as the Pantone color of 2019. Living Coral is considered a life-affirming shade, as it is an explosive color that pops. Use this color as a staple in your wardrobe and within your home this coming year. Selecting a Pantone color is no easy feat; It comes with societal consideration and current trends. In a statement from the Pantone Color Institute, Living Coral is a “reaction to the onslaught of digital technology and social media increasingly embedding into daily life”. It has a “humanizing and heartening” connection. How will Living Coral be used in home design and decor? The beauty of interior design color trends is that you won’t see it splashed anywhere any everywhere. Your neutrals can still be used with a splash of Living Coral. Your home does not have to be overwhelmed with this singular color. You can use it to enhance beauty and create style in your own way. When it comes to the Pantone ‘Color of the Year’, it is all about minimalism. Here are some ways we will be using Living Coral in 2019. 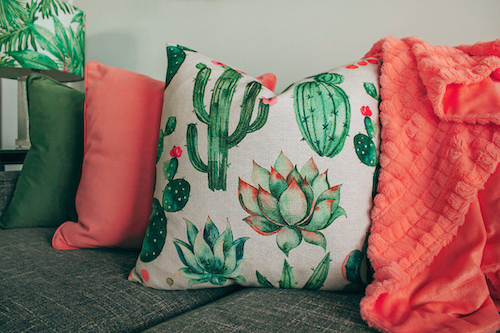 When Spring turns to Summer, we will surely be playing with Living Coral in the form of throw pillows and blankets. Envision outdoor cushions on the back patio and bright blankets draped across your bed or living room sofa. Gone are the days of requiring perfect, white plating at every meal. Kick your creativity up a notch with items like this Coral dinnerware on Etsy. Many homes have their dinnerware sets on display as a design feature. Alternatively, consider using the vibrant Living Corel color on place settings, table clothes, runners or centerpieces. Be prepared for an influx of Living Coral accessories for your home. Kitchen color accents will range from dishwashers to KitchenAid stand mixers, like this option from last year’s Ultra Violet Pantone selection. The Pantone selections over the last few years have been bright which has given us the flexibility to integrate playful colors into the home. Kitchen accessories are an excellent way to integrate popular colors into your living areas. At MDK Designs, we are big fans of feature walls. Especially, accent walls that can be updated every year. Consider using the Living Coral feature wall in an office or spare bedroom accompanied with the perfect accessories. 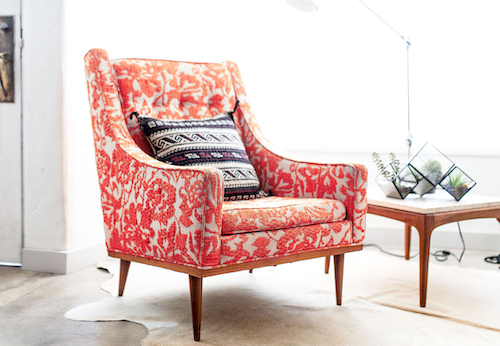 Accent chairs are an easy way to integrate pops of color into your home. You can find plenty immediately after the Pantone ‘Color of the Year’ is announced. 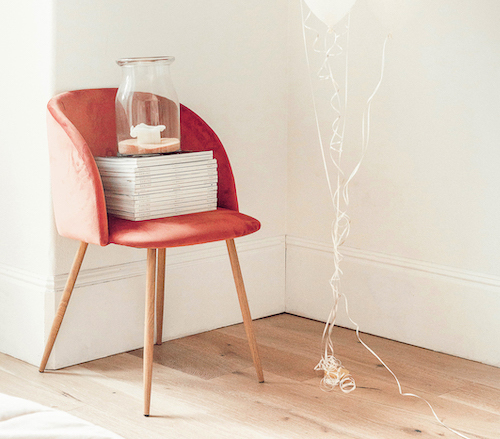 This Velvet Elowen chair on Anthropologie is a lovely option in Living Coral. We always look forward to using the Pantone ‘Color of the Year’. We are already working Living Coral into our designs for some trendsetting and fashion forward clients. Contact Melanie Kokoros, Interior Designer at MDK Design Associates with questions on how you can use Living Coral in your home. Looking for new and exciting holiday gift ideas now that Thanksgiving is behind us? The season is ablaze with Holiday gift buying and planning seasonal festivities. 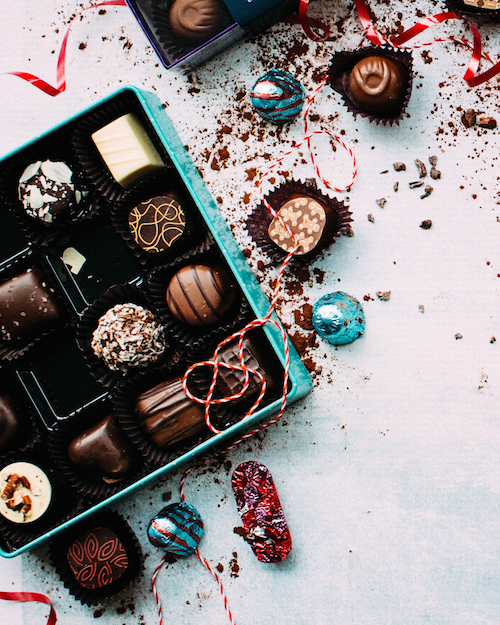 For those who celebrate Hanukkah, Christmas, Kwanzaa or others, this is the time of the year when gift giving is abundant and Holiday decor is all around us. Celebratory dinners, lavish brunches and time spent with family and friends is truly what matters at this time of the year, with all of us carrying gifts in tow as we move from event to event. That’s precisely why we created this MDK holiday gift ideas guide for 2018, your bookmark-worthy resource for the design aficionados in your life. 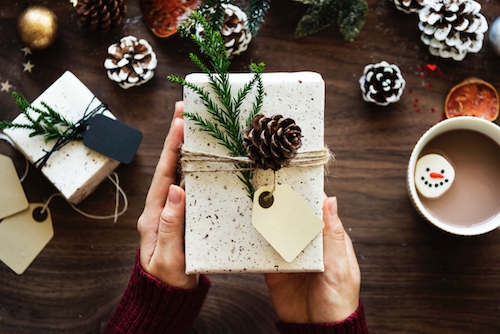 Gift giving for those family and friends who have the perfect home can be challenging; after all, they have the perfect vision for their homes, it can be a daunting thought to contribute in a meaningful way. This MDK guide to holiday gift ideas has you covered. As you’re shopping for the homeowner or designer in your life, consider these options. At MDK Designs, we rely on our sketchbooks – after all, you never know when a wonderful idea could come to us. From the home to the grocery store, the office to the job site, visions arise everywhere. For the hobby designer, a sketchbook is a great gift idea to accompany him or her along on their home journey. There are beautiful options online, like this Moleskine Custome Edition. 2. 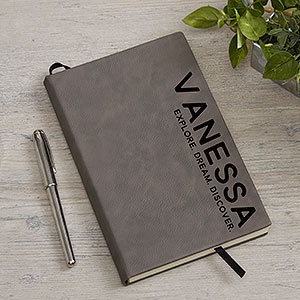 A Personalized Journal is the Perfect Place to Write Down Holiday Gift Ideas! A personalized journal is a perfect gift for the traveler, songwriter, screenwriter, or anyone who enjoys recording their daily experiences, adventures, thoughts, and reflections. You can customize a journal with a monogram, engraving, logos, photos, and designs. For a personal touch, consider using the name of the gift recipient and a meaningful quote or 3 inspiring words. You will find many creative ideas on https://www.jbcustomjournals.com. Hostesses and hosts always need new dishware – and it certainly doesn’t need to match! Options such as Moscow Mule Mugs are excellent, as they are unique for the tender behind the bar, yet can also double as a DIY decor piece on a table or two with small florals inside. You may also want to go that step further by personalizing the barware with a nickname or limerick. We love local businesses, and we love custom home decor. 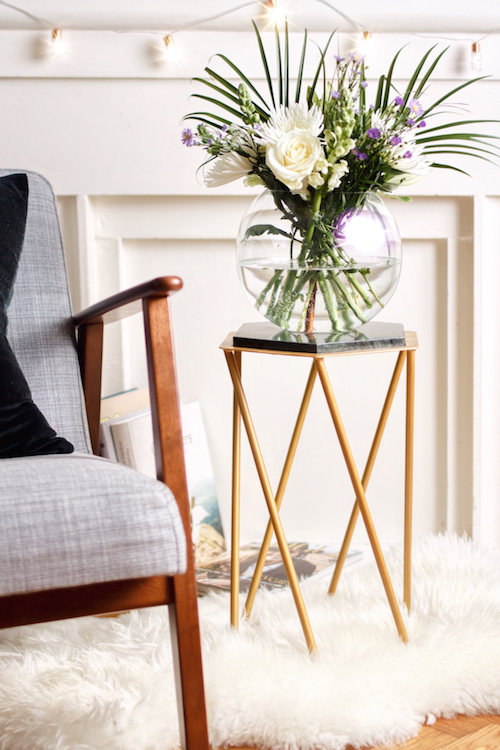 Plus, who doesn’t need another vase in their collection? This vase from Jill Rosenwald is a favorite of mine, handmade to order in Boston. Couple a beautiful handmade vase with seasonal flowers and a festive ribbon add a design flourish of your own. When you start thinking of holiday gift ideas, consider local businesses. Shopping local adds a unique and special element to the present that nationwide retailers don’t have, especially if you are gifting it to an out of towner. When you have family at your home, consider holding a DIY Wreath Night! 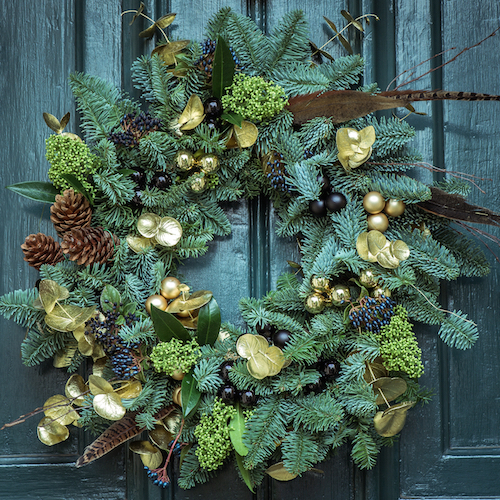 Gather your necessities – like wires to create the frame, greenery (your choice), embellishments such as holly, bells, pinecones, and any other additions you would like to add. Set out to create a number of wreaths during your DIY night, and gift them over the holidays — a personal, thoughtful gift for your loved ones. When attending a Holiday party or dinner, you will likely arrive with an appetizer. Why not get creative with what you bring, and have a leave-behind as an accompaniment? 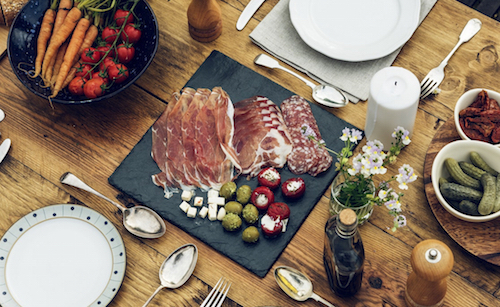 We love the idea of a large cheese, and cold meats board, especially ones found at Brooklyn Slate Co. Arriving with cheese and charcuterie is always sure to impress, and a unique slate is just as excellent for the host. Every designer, or designer at heart, loves table books. 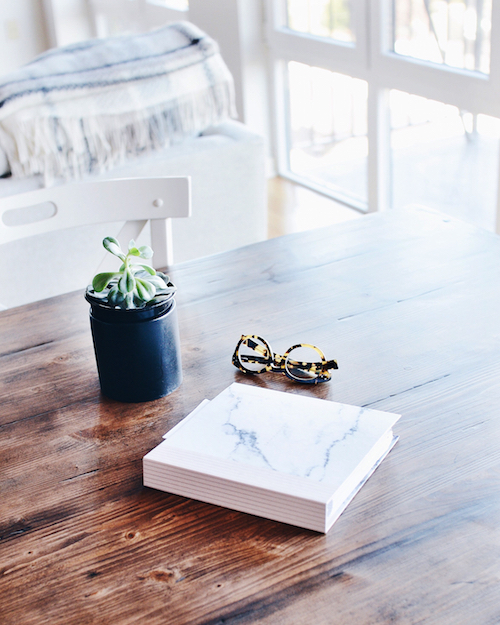 Whether you read them from back to front, or perhaps they sit on your side table for guests to peruse through, it’s always helpful to have impressive table reads at your side. One of my favorite options this Holiday Season is the new, beautiful book, ‘Dior and His Decorators: Victor Grandpierre, Georges Geffroy, and the New Look.’ It is a fantastic read with remarkable photos that are sure to start a conversation. You can go one step further by creating a personal lay flat coffee table book using photos. We’re big believers that you can never have too many throws in your home. From curling up on your sofa in the evening with a movie on the television to changing your throws throughout the year as you freshen up your home decor for the seasons. One of the more safe and sensible Holiday gift ideas is a warm and neutral throw. Consider tying yours up with holiday-themed ribbon and a note of ‘festive good wishes’ for your family members and friends. We are excited for the Holiday season ahead, and can’t wait for gift exchanges with our family and friends. As you are preparing for your Holiday with the designer in your life, consider the 8 MDK holiday gift ideas. Contact MDK Design Associates for help on your interor design projects. 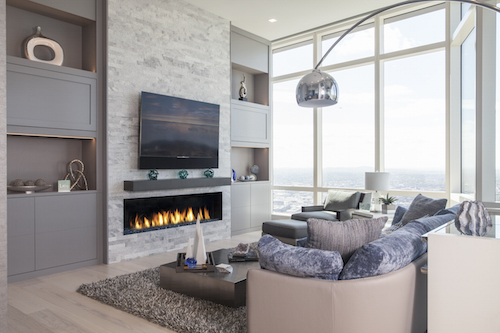 Fall interior design ideas are on the forethought of design enthusiasts this season. It’s time to start thinking about fall home decor. 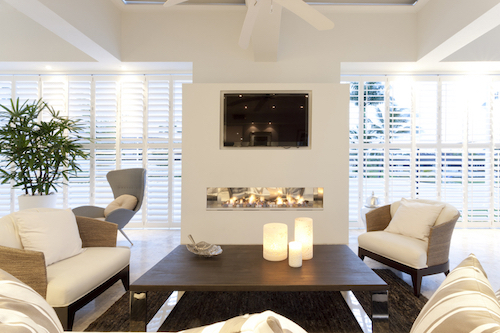 Start gathering interior decor ideas while the weather is still warm. Fall is the season where interior designers are aligned in their excitement and design vision. It’s time to transition our homes from summer to fall. Prepare for colder weather with warm, cozy interiors to enjoy after a long day at work. Transitioning your home from summer to fall might sound like an enormous task – two remarkably different seasons! Melanie Kokoros, MDK Design Associates Owner, has provided 6 fall interior design ideas she applies in her own home. Throw pillows in the summer likely reflect the brightness of the season – blues, greens, yellows, and pops of other colors. In the fall, it’s essential to bring the outdoors, inside. 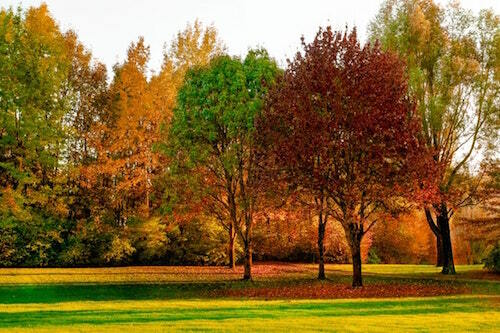 Consider warm hues of red, brown and orange to reflect the fallen leaves. Coordinate warm tones with beautiful intricate designs and patterns to brighten your living area with autumnal touches. 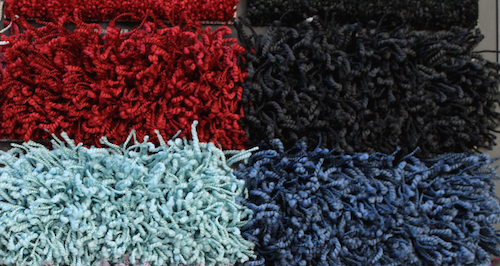 During summer, rugs are typically light and less plush for the warmer months. Maybe you don’t have a rug in your living area at all during the summer! To freshen up your room in the living area, bedroom, guest room or otherwise, change your rug for something more luxurious. A warm and comfortable shag rug brings coziness to any space, where a darker hue with fall tones will also do the trick. You wouldn’t have a heavy duvet on your bed during the heat of summertime. 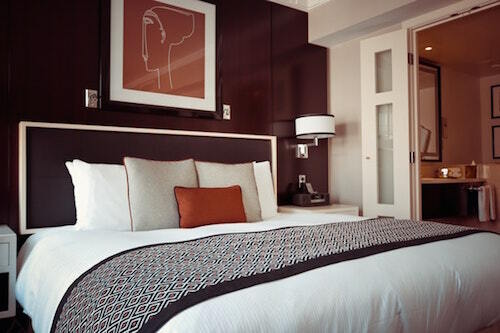 During the fall there is nothing better than snuggling down during cool, crisp nights with a warm duvet. 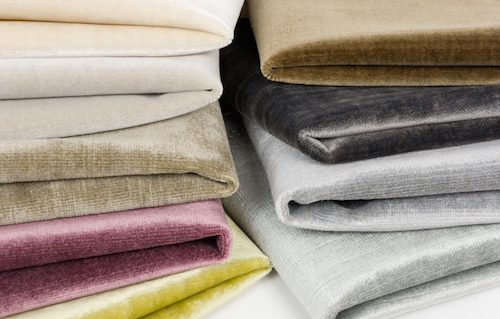 It’s time to bring back your duvet, along with your fall bedding. Deep grey, blue and browns will compliment the outdoor weather beautifully. Change your dinner wear to something that better reflects the season. It’s an easy way to update your dining table and dining area. Add deep yellow and green dinner plates, bowls and cups for an inexpensive way to decorate your table. 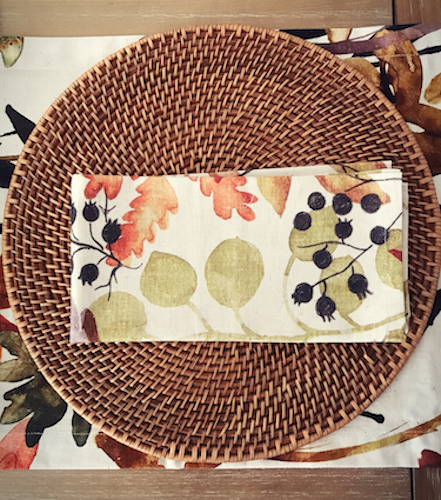 Update your table runner, placemats and dinner napkins to tie the room together. Retailers such as Wayfair offer a great selection of fall items and often have a Labor Day sale so you can save. Fall is a favorite for many of us, particularly because of the beautiful, crisp air that encompasses Boston. It’s a great time to head outdoors and take advantage of fall activities before the snow hits. Embracing the colors and smells of the fall atmosphere is a great way to bring the outdoors, inside. 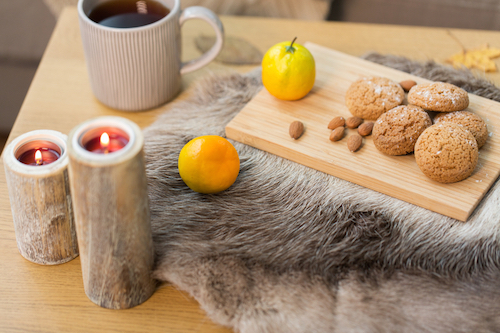 Add nature-themed colors to your home, such as pine cones on your side table, a dimly lit candle, or a rustic wood bowl on the kitchen counter. Squash, gourds, and smaller pumpkins can be added in a decorative bowl instead of displaying your favorite summer fruit. Fresh apples and a cinnamon stick displayed on the dining room table, will be visually rich with color and smell delightful. There are so many ways to update your home for fall. Layering cozy textures in the colder months, such as sheepskins on your side chair, flowers in metallic vases or a cream throw on your leather sofa, is a great way to create an inviting ambiance in the home. 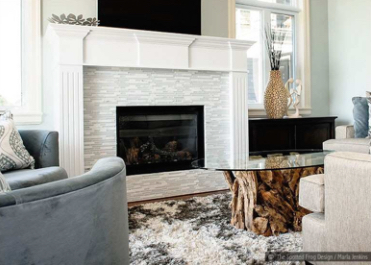 Don’t be afraid to play with textures in various rooms of your home, like your living area or home office. These fall interior design ideas will help you transition your home from summer to fall with ease. As we head into the upcoming season, envision your living area and all of the possibilities that it holds, for you and your family. As the season changes and the temperature drops, with all the holidays that this season brings, your family and friends will start to gather in your home. From new throws to duvets, hints of the outdoors to added textures and layers, enjoy the season ahead! For more inspiration have a look at the MDK Design Associates portfolio page or email Melanie Kokoros for information about your next home decorating or renovation project. 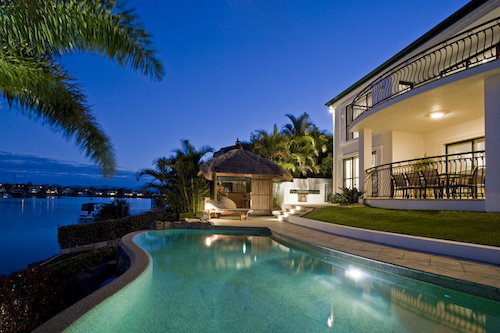 Outdoor design ideas can make your backyard, patio, veranda or terrace experience more enjoyable. This time of year, summer in the Boston area is truly beautiful. The weather is warm, though the breeze from our backyards and waterfronts provide some cool relief while we spend long evenings outdoors. It’s this time of the year our hard work pays off by creating comfortable outdoor spaces to enjoy the fruits of our labor. Outdoor designs are a love of labor for MDK Design Associates – devising plans and drawings that help our clients find their outdoor oasis. That’s why we’re sharing these ideas with you now, so you can do the same. Reading is a stress relief – in fact, it was found in a 2009 study that reading can reduce stress by up to 68%. Amazing! We believe that reading in a space that’s yours, that provides an oasis for you can be a great way to utilize your outdoor space. Whether it’s a small nook on your back patio or a dedicated green space, an outdoor reading area simply needs a chair or two, a great outdoor foot rest or weather-proof table and a blanket. Candles and lighting are optional. Rope and string lights are so popular, and they don’t seem to be going away. 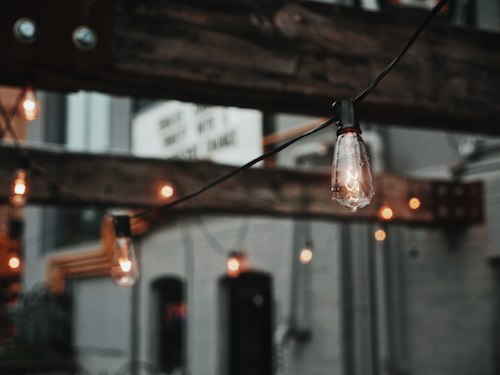 It’s a trend that we’ve seen for a couple years now, as it’s a great way to make your outdoor space feel cozy, giving it a vintage flair with a minimal investment. Have you considered an outdoor television for your back patio? If you have a covered space (preferably surrounded by outdoor lounge furniture) it can be a great way to extend summer parties and barbeques. An outdoor television is quickly becoming a great trend, as it gives guests extra entertainment outdoors. Who wouldn’t want to watch the Boston Red Sox on an outdoor patio in the Summer? We highlighted how much we love outdoor fire pits in our Spring blog, and it certainly hasn’t gone away for the summer. As warm as it can get here in Boston during the summer, fire pits are a great way to bring everyone around the circle as the night is extended and a chill arrives in the air. 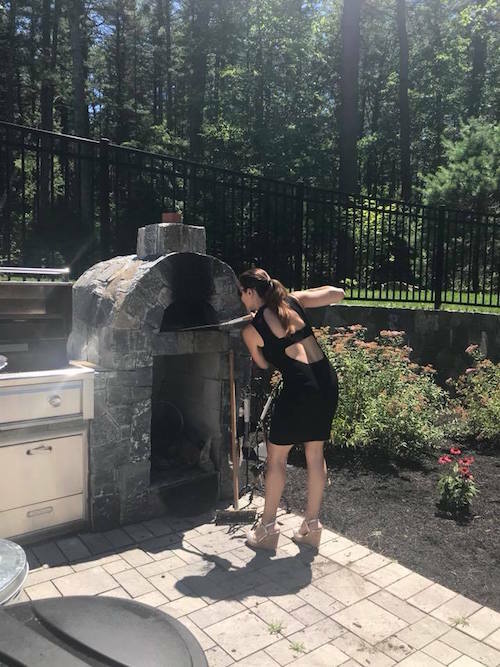 You can also consider a stone pizza oven to maximize your experience for family and friends. We’re big fans of outdoor florals here at MDK Design Associates, especially florals that don’t require a great deal of maintenance. Lavender and Salvia be planted this time of year to prevent mosquitoes and attract butterflies. Lavender gives off a lovely fragrance and adds a pop of purple color amongst your greenery. Above all, creating an outdoor space that is truly yours is so important – this means adding your own personal touch to your outdoor sanctuary. Don’t be afraid to add little mementos on tables to reflect your family life or past travel explorations, include scented candles that remind you of past memories, or your own twist and personality to your space. 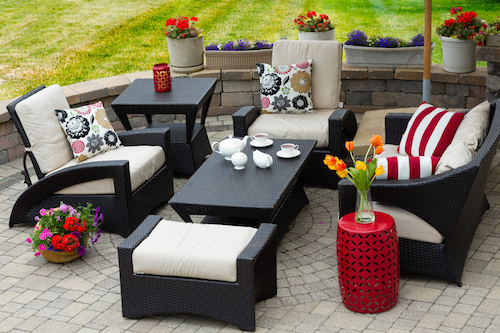 When thinking about outdoor design ideas for your space, the priority should be on comfort. Create a space that makes you feel relaxed and excited to spend time in at the end of a very long day. 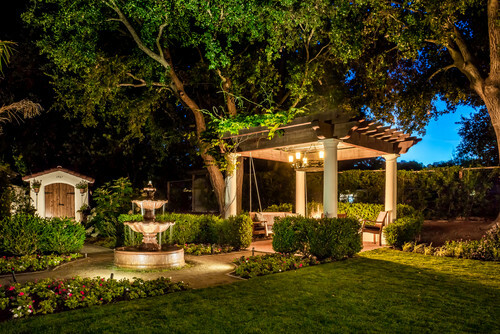 Contact MDK Design Associates to discuss your outdoor design ideas. MDK Design Associates shares 8 decorating tips for the July 4th holiday to help get your homes ready for a week filled with celebration, decoration and outdoor activities. The 4th of July – Independence Day – commemorates the adoption of the Declaration of Independence on July 4, 1776. This is the day that the thirteen American colonies formed as a new nation, which became the United States of America, no longer part of the British Empire. 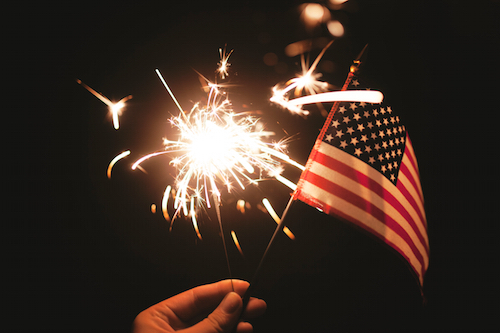 In our present day, the 4th of July is a significant holiday celebration, with 219 million Americans expected to celebrate, spending a whopping $7.1 billion on barbeque goods, decor and more. Wow! 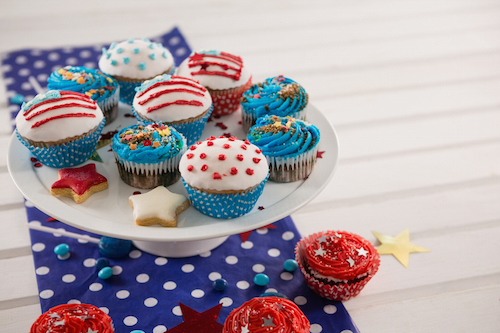 If you are one of the 219 million Americans who are taking part in 4th of July celebrations, we have the decorating resources you need to ensure your Holiday decor is the talk of the block. We love everything about swizzle sticks, which are stir sticks with a twist. These glittering star-topped sticks from Crate & Barrel are especially great – or you can make your own. Simply grab small wooden sticks from your local craft store and glue on a cute top, like these gold and silver stars, or little US flags. Place them on your dinner tables or bar tops to let your guests add a little decor to their beverages. You can’t skip out on 4th of July florals, right? A patriotic bundle of flowers as your guests enter your home can set the stage for what is to come. Find florals like anemones, alliums (deep blue, of course) and phlox. They’re great in the heat and they are simply beautiful. So simple, so affordable – and available on Amazon! 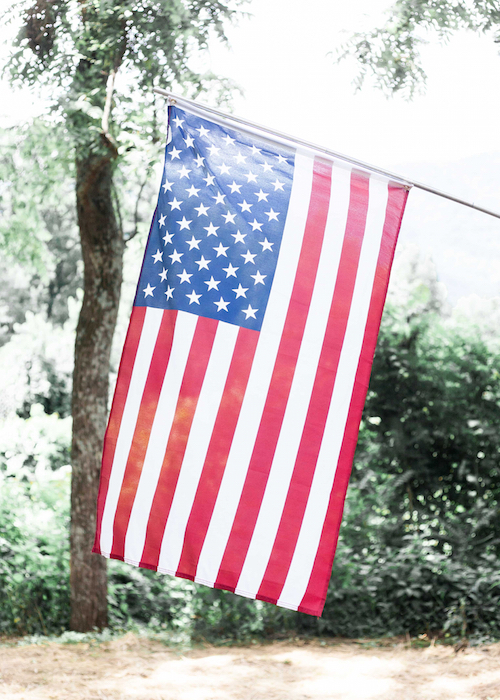 We found this flag banner string than can be added to your outdoor fence in a flash, and it’s under $15.00. This is so cute and so easy that can be placed everywhere, from the aforementioned fence to the dinner table. If you have kids joining you for your outdoor barbeque or indoor dinner, it’s important to get crafts ready for the little ones. One of our favorite crafts for the kids is to make place cards for dinner time. Grab some red, white and blue stationary from the craft store, some themed stickers and washable felts. Assign your kids with the task of finding a spot at the dinner table for each and every guest, and thoughtfully write out their name for each place card. It’s a great way to get the little ones engaged during dinner time. 5. Bring out the table runner. Patriotic table runners don’t have to come in the form of red, white and blue; instead, we love a table runner like this that can act as a foundation to build your table. Build from this to include red dinner napkins, the glittering star-topped sticks (see tip #1), silver cutlery, and complete with some red, white and blue sparkle to place across the table runner. We love this stars and stripes patriotic flower pot from Lolly Jane. All you need to do is grab a 10” flower pot, foam brushes, red, white and blue outdoor paint, and (optional) vinyl lettering stars. Paint the entire flower pot white, let dry, then add two red stripes. On the top of the pod, paint this blue and add your stars. So easy! If you’re having an outdoor barbeque, lantern jars are sure to make your outdoor space feel cozy. Grab the most simple, clear lantern jars you can find (they can even be mismatched!) and fill the bottom with sand. Place a faux candle inside and you’re ready for the night to begin. 8. Head home with a patriotic goodie bag. 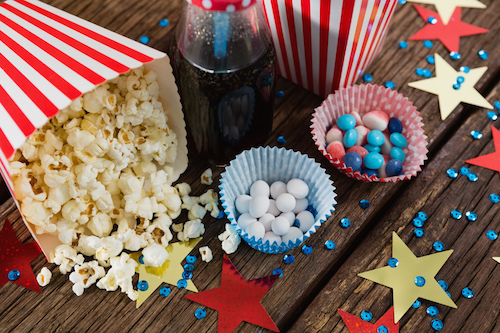 Your guests will love to head home with a patriotic goodie bag, one that they can enjoy well into the week. From sugar cookies tied with blue and red ribbon, to red and blue lollipops, or even a personal note from you, the host. 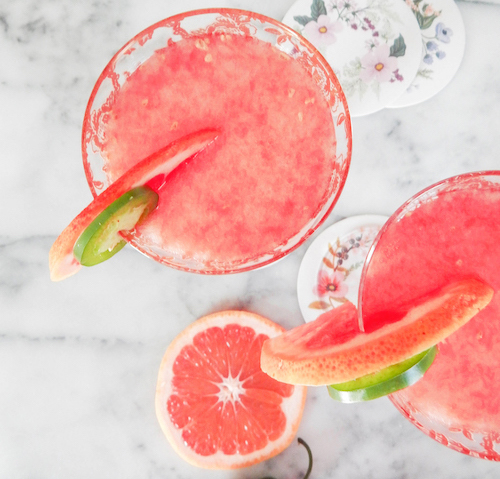 With the holiday right around the corner, these 8 decorating tips for the July 4th holiday are sure to help create the party of the Summer in your very own backyard. Need more than 8 decorating tips for the July 4th holiday? Contact MDK Design Associates for more decorating ideas. From MDK Designs to you and yours, Happy 4th of July!